What is a Belleville Washer? These cupped spring washers flatten out as pressure is applied to them. They are commonly used to produce exceptionally high loads in small areas. Coned disk washers can absorb and dampen shocks and vibration as well, making them useful in many industries and applications. Refers to the axial load placed on a fastener. Pre-load is considered to be 75% of the proof-load. A test load a fastener MUST be able to hold without causing any compromise in its integrity. Considered the maximum safe load of a fastener. The degree to which a structural element is displaced under a load. Due to their resistance to vibrations, conical washers are also considered to be lock washers as they perform a similar function. These disc spring washers are not only useful on their own but can be stacked in several different structures for increased resistance / absorption as well. Spring washers can be stacked in several structures to increase certain characteristics they produce for optimal performance. 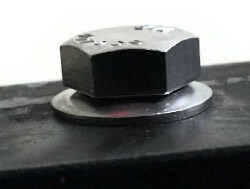 A series stack involves placing the washers top to bottom so that they create a gap in the middle. This can greatly increase the deflection of the stack by adding a spring like effect to the washers. *Note: This stack does not increase the load capacity of the fastener assembly. A parallel stack involves placing all of the washers in the same direction. Each added washer increases the load capacity of the stack. *Note: The deflection does not increase based on this stack. The mixed parallel/series stack involves performing both types of stacks in a single fastener assembly. This increases both the load and deflection and can be arranged to suit almost any situation as needed to comply with the project needs. Please note that while Belleville spring lock washers are exceptionally versatile and can be stacked in multiple configurations, the washer that rests against the installation material must always have it’s widest portion against the material. Due to Belleville washers being so versatile, they have many different uses and can be found in many different industries. Can Belleville Washers Be Reused? Yes, Belleville conical washers can be reused, repeatedly, as long as they are not damaged. Overloading and over-torquing these washers can wear them out over time. As long as they are used properly and checked before reuse, these fasteners can be used again and again to complete projects. Determine the project load capacity and deflection. Decide which Spring Washer Stack will give you the optimal results. Slide the washers onto a bolt in the optimal stack. Slide the bolt through the installation material with the stack pressing against the installation material (remember the base washer must be facing down). Tighten the bolt against the other side of the installation material.